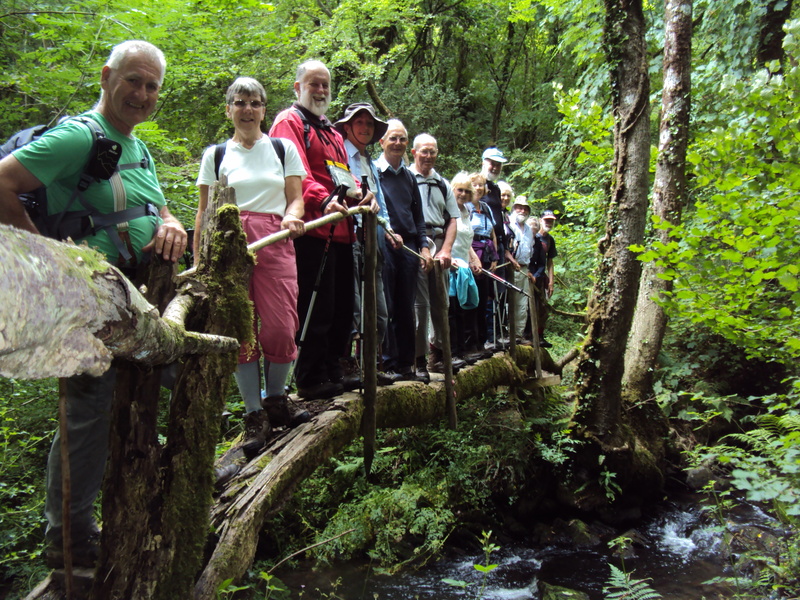 Reports from local U3A group activities. Firstly a huge thank you to everyone who came to Cardiff, smiled their way through 8+ hours of an extremely hot and stuffy Jubilee Hall and played magnificently. This year the competition was open to teams from England, was very much bigger and we met with a lot of serious and dedicated league players. There were 34 teams and everyone played an average of 9 matches. Overall we took 7th place (Gaynor Evans & Tony Tiffen) and 9th place (Chris Harries and myself), and the trophy for Group 4 went to Pauline Tiffen & Geraint Williams. 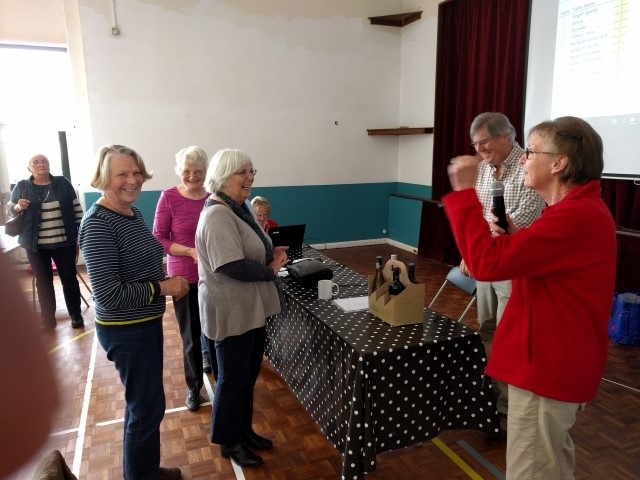 John Healey partnered Pat Mason who kept going even though still recovering from an injured wrist, and Ray Lockyer was partnered by Margaret Carter, our newest member. All of them did us proud. The Sophia Gardens cafeteria provided very good breakfasts and lunches. Thanks go to Chris who organised a Portuguese meal on Monday night, and to Gaynor who took us back to last year’s Italian restaurant on Tuesday – both excellent meals. Thanks also to Muriel who was unable to play but stayed with us all day and gave help and encouragement. Last but not least we owe thanks to Phil Avery who gave the time and effort to organise the competition. This entry was posted in Group Reports, Uncategorized on June 28, 2018 by Geoff Winterman. 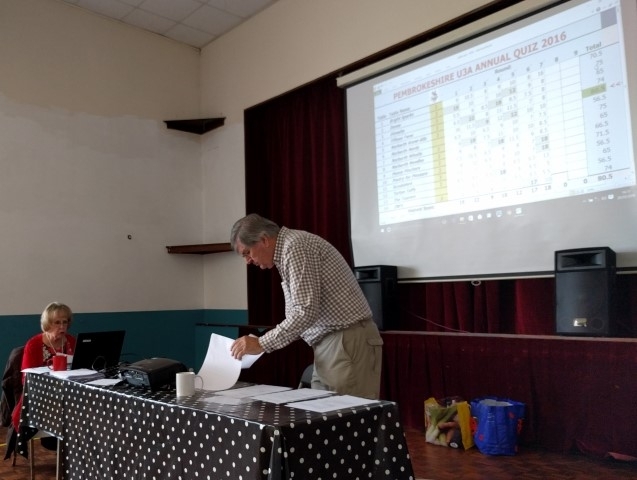 Six teams from Pembrokeshire U3A entered the Narberth U3A annual general knowledge quiz on 18th November, & answered questions on ten subjects ranging from “quotations” to “food & drink” to “music” to “inventions”. 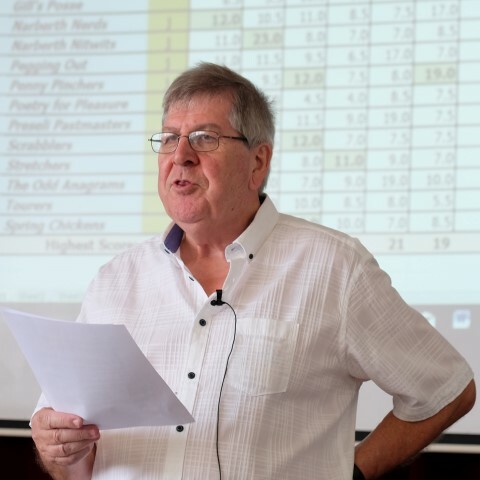 We gained revenge for the result at our own quiz in May, when teams from Narberth finished 1st & 2nd, with our team of David & Chris Pinch, Helen Kift & Peter Brown finishing first by a whisker from Anne & Derek Church & Marcia Heaviside. This entry was posted in Group Reports, Past events on December 5, 2016 by Mike Wort. On the afternoon of Friday 20th May fourteen teams off quiz enthusiasts assemble at the Neyland Athletics Club for our Annual Quiz. We were under the experienced supervision of Peter and Ann Brown. As you can see from the scoreboard above we were joined by four teams from Narberth U3A and in a closely fought contest the appropriately named “Narberth Know Alls” were victorious. 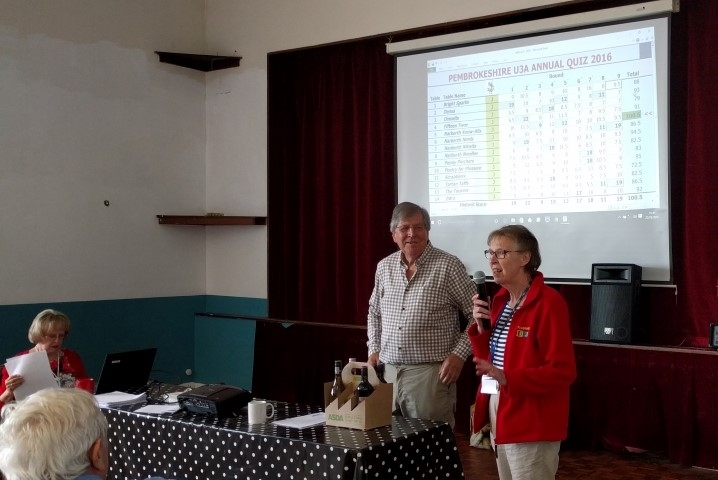 Chair of the Pembrokeshire U3A, Penny Thomas, thanked Peter and Ann for devising the quiz and organising such a relaxed and enjoyable afternoon. This entry was posted in Group Reports on May 21, 2016 by Geoff Winterman. On the morning of 30th March the above meeting was held at the hall in Merlins Bridge. Without our Group Leaders we would not have a U3A and equally without a flow of new members we would fade away. The meeting included nineteen Group Leaders and ten new members. It was pleasing to see so many group leaders who introduced themselves indicating their own group and representing those Leaders who were unable to attend. The discussion was lively with a new member keen to join the Mah Jong group and others expressing an interest in one of the, always popular, walking groups and the table tennis. We are most fortunate in the number of diverse groups on offer; the new members became aware they could have both their bodies and their minds exercised! Should you have an interest not covered by one of the groups why not start your own? The committee and the National Resource Centre will give you as much help as you may need in setting up a group. 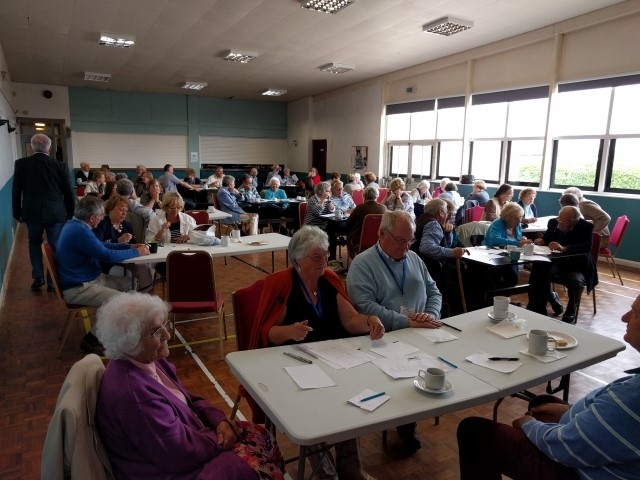 May I on behalf of the Committee extend a big thank you to all the Group Leaders who give freely of their time enabling us to have a great and growing U3A. This entry was posted in Group Reports, Past events on April 1, 2016 by Mike Wort. On the morning of 10 September 40 members of the group to include 3 from Narberth U3A boarded a coach bound for The National Botanical Gardens of Wales, the last time we undertook such a trip was in January 2014. It was decided to make this trip following a talk given by the curator Mr Simon Goodenough who indicated September was his favourite time in the garden and we could certainly see why. Immediately, we were struck by the changes that had been made particularly to the long boarder leading up to the dome, rather than the random herbaceous plants with a multitude of colours this has now been replaced by a softer colour planting ranging from the soft pinks of the geraniums and phlox to lavender, and on to the deeper shades of the many asters (we tend to call Michaelmas daisies) and finally tall purple verbena the feature of many dried flower arrangements a plant that appears frequently in the areas leading up to the dome. A pathway has been laid adjacent to the boarder which takes the visitor to the rear of the plants an excellent addition. The vegetable garden was spectacular with red and yellow stemmed chard, rows of runner beans, the unmistakeable tops of beetroot, turnips, swedes, wonderful red cabbages to name but a few. Another new addition is a potager plot which combines both flowers and vegetables my particular favourite. This entry was posted in Group Reports, Past events, U3A Activity reports on September 18, 2015 by Geoff Winterman. I thought you might like to see this photo which I took of the Rovers on their recently billed “adventurous” 7 mile walk near Login. The “bridge “ is a fallen tree with the rounded edge shaved off to make a crossing. The supports and rail/rope were put into place by the walks co-ordinator and myself prior to the walk. At the end of the walk 4 said they wanted medals 3 said they would view with gravest suspicion any future walks that I planned , 6 were too tired to say anything and my wife said she wanted a quiet word when we got home! Fortunately, on completion, they were somewhat mollified by the teas and cakes at the Cardi-Bach celebration at Login “Station”. This entry was posted in Group Reports, Past events on July 19, 2015 by Mike Wort. Table Tennis Group – 25th Anniversary Match!! As part of the Pembrokeshire U3A 25 year celebrations our Table Tennis Group made a return visit to John Wright and his friends who play in Llanfallteg. John had kindly organised a tournament and fifteen of us enjoyed an evening of great fun and lots of activity. The evening ended with a cawl supper and puddings to die for! We really appreciated the hospitable welcome and friendly atmosphere which helped to make a memorable evening, and a big thank you is due to John and his friends. We look forward to them making a return visit in the Autumn – Could this be the start of a tradition? This entry was posted in Group Reports on June 24, 2014 by admin.